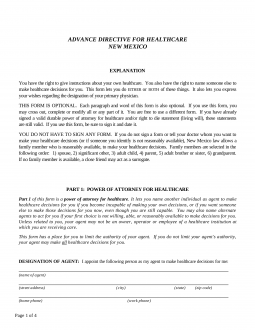 New Mexico Advance Health Care Directive (POA & Living Will) operates as two medical directive forms in one. In Part I (durable power of attorney for health care) allows you to appoint a friend or relative to act for you if medical decisions arise and you are not in a position to make them yourself. For instance, if you are unconscious from an accident and the doctors need to determine how to treat you, you can have someone who they turn to make the decision. In Part II (living will) will address a scenario where you have contracted a terminal condition and have certain preferences for treatment, but cannot communicate. If you have one of these forms in place, your agent can act for you to make sure your preferences are communicated to the concerned medical staff. Durable (Financial) Power of Attorney – A document which allows the Principal to select an individual to represent them in managing finances and property. Locate one of the buttons beneath the preview image. You may select either one to obtain a working copy of this directive but make sure you have the software necessary to edit it. If no such software is available to you may print this form after opening the PDF version in an up-to-date browser. Find the first page, then read it carefully. Below this, you must produce the Full Name of the Agent on the first blank line. Then, on the second blank line, record the Agent’s Full Legal Address. Finally, use the last blank line here to record the Agent’s Current Telephone Number and Current Work Number. The top of the next page contains an area where you may report up to two Alternative Agents. These entities will serve as the Principal’s Health Care Agent should the one named on the first page be unable to carry out his or her duties as such. You will need to report the order in which they seize the Principal Power to make Health Care Decisions and take Action. That is, enter the Name, Address, Home Number, and Work Number of the Alternative Agent who will take over when the Primary Agent is unavailable in the first column. In the second column, document the Name, Address, Home Phone Number, and Work Number of the Alternate Agent who will assume the Principal Power granted to the Primary Agent should both he or she and the first Alternative Agent cannot assume Principal Power. Next, in the area labeled “(1),” below the bold words “Agent’ Authority,” you will be presented with a list of treatments/procedures where the Principal’s Agent may Consent or Refuse on behalf of the Principal and for the Principal. You may cross out any items the Agent should not have Principal Power to represent the Principal’s Preferences with. Any bullet point on this list that has been deleted or crossed out will be a treatment or procedure the Agent will not possess Principal Authority in. If this list is left unmarked then each bullet point will describe a procedure, treatment, or service the Agent will retain Principal Authority over when representing the Principal’s Preferences. Item (2) will declare the Principal Agent’s Authority in selecting Health Care Providers and Institutions where the Principal will receive Treatment. If the Agent should not have this Principal Power, then cross out this statement. There will be an area below these two items, where you may report any additional limitations that should be placed on the Agent’s Principal Powers. 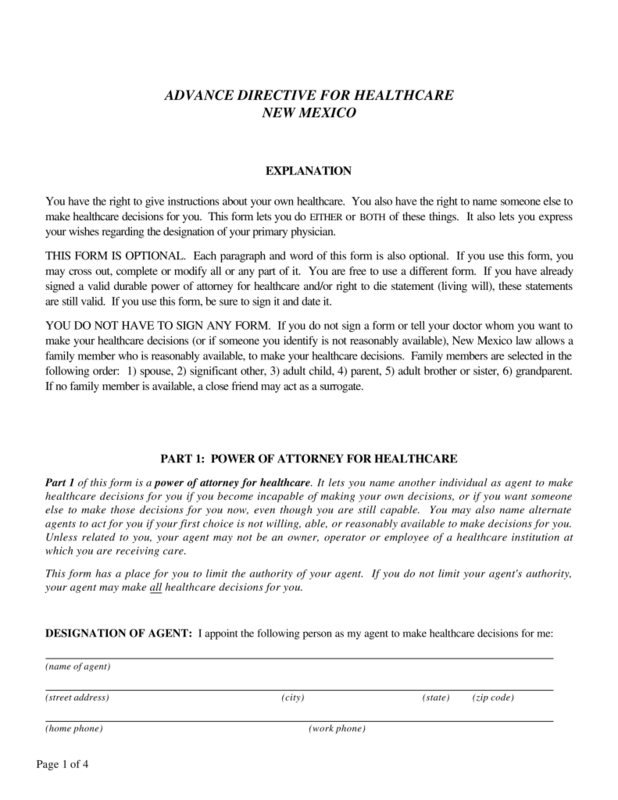 If the Agent should receive Principal Power when the Principal signs this paperwork, then he or she should initial the bracketed line under the bold words “When Agent’s Authority Becomes Effective.” If it should become Effective when the Principal is diagnosed as incapacitated and unable to make decisions (by a Physician) then, leave the bracketed space in this section unmarked. Find the bold words “Nomination of Guardian.” If the Principal wishes the Primary Agent (or if unavailable Alternative Agents) to act as his or her Guardian or Conservator of Estate should the court require one, then leave this paragraph unmarked. If the Principal does not want these parties to be appointed as a Guardian or Conservator (if the court requires one) then, he or she should cross out this paragraph. The next page will provide several choices across various topics. The Principal should review each one, then initial the bracketed line corresponding to the statement defining the Principal’s Preferences. We will begin with the paragraph labeled “End Of Life Decisions.” If the Principal is faced with a life-threatening scenario with little hope of recovery, then his or her preferences should be understood. If the Principal does not want his or her life prolonged in this scenario, then he or she should initial the first bracketed space. If the Principal does want to prolong his or her life, the Principal will need to initial the second bracketed space. If the Principal prefers, he or she can appoint the Agent to make such a decision at the time by initialing the third blank space. Next, we must attend to the four statements in the paragraph labeled “Artificial Nutrition And Hydration.” Four Choices are presented. The Principal must initial either the first statement to convey he or she would not Artificial Nutrition to prolong his or her life or initial the second statement if he or she does wish to receive Artificial Nutrition during an End Of Life Event. The next two statements will also give a similar choice. If the Principal does not want to receive Artificial Hydration during an End Of Life Crisis then he or she should initial the third statement. If he or she would like to receive Artificial Hydration in this situation, the fourth statement must be initialed by the Principal. Now, find the paragraph labeled “Relief From Pain.” By default, this document will call for the Principal to be kept as clean and pain-free as possible during a life-threatening medical event with little chance of a full or partial recovery. If the Principal would like to add to this or limit this, his or her preferences should be documented in the space directly below this paragraph. Finally, locate the paragraph labeled “Anatomical Gift Designation.” If the Principal is willing to donate any of his or her Organs and Tissues at the time of death and willing to be put on life support to increase the viability of the donation then, he or she should initial the first bracketed space in this area. If the Principal only wishes to donate some of his or her Organs and Tissues at the time of death, the second bracketed space should be initialed by the Principal. Additionally, a list of what may be donated must be supplied in the space provided. The Principal may choose not to make any Anatomical Gifts. In this case, the third statement in this area must be initialed. The Principal has decided to let the Agent make the decision as to whether an Anatomical Gift should be made. If so, the Principal should initial the last statement. The area below the heading “Part 3: Designation Of Primary Physicians(s)” has been included so the Principal’s Primary Physician may be contacted when necessary. Two columns have been provided so that two separate Physicians may be documented. Use the column on the left to document the Principal Primary Physician’s Legal Name, Address, and Phone Number. The second column has been supplied so you may document the Name and Contact Information of an Alternative Physician in case the Primary Physician cannot be located. Record the Alternate Physician’s Legal Name, Address, and Phone Number using the blank lines in the second column. In order to verify these instructions as the Principal’s Preferences, he or she will need to sign his or her Name. This will be done in the area labeled “Signature Of Principal.” The Principal will need to begin by signing his or her Name on the blank line labeled “Your Signature” then, enter the Date this Signature is provided on the adjacent blank line. Finally, the Principal must enter his or her Street Address, City, State, and Zip Code using the last two blank spaces below his or her Printed Name.